Avital holds a Mandel social leadership MBA from the Ben Gurion University of the Negev. She founded the “Derech Lod” community, previously established and managed the student branches of “Pa’amonim,” and worked at the Moses & Wolfowitz Foundation. Avital participated in the social leaders track of the "Kolot" study groups, and is active in a variety of organizations dealing with education, equal rights, promoting dialogue between Jews and Arabs, and strengthening civil society in Israel. Ayelet holds a BA in English Literature and Linguistics from Bar Ilan University in Ramat Gan. Prior to working at Jindas, she was the office manager for the Abraham Fund Initiatives. Ayelet is passionate about advancing coexistence and shared community in diverse neighborhoods and promoting multiculturalism in Israel. She is also an avid activist for animal rights. Yifat completed her BA in Computer Science at Bar Ilan University and her Masters degree in Technological Design at Bezalel Academy in Jerusalem. In the past ten years, Yifat was the Business Development VP in Comply LTD. Prior to that, she founded and managed issue CS company, which supplies solutions to staff expansion plans in the Hi-Tech sector. In addition to her rich business experience, Yifat is passionate about promoting social issues, especially expanding economic oppurtunties for weak community in pursuit of a more just society. Born in the City of Lod, Aulfat is Criminology and Communications graduate of the Unisa University and a certified Real Estate Advisor to the Ministry of Justice. Currently studying towards a graduate degree in Education at Beit Berl College, Aulfat was previously an executive manager of real estate consulting for Anglo-Saxon and held various other positions in the company over a 14 year career there. Aulfat’s social involvement began as an active member of the Scouts of Lod and she later volunteered in various local organizations including the Young Mothers of the City of Ramla. Maha Shinawy, Early Childhood Coordinator, was born and raised in the Ramat Eshkol neighborhood of Lod, Israel. She is the mother of four wonderful children and a well known and beloved community leader. By profession, she is an elementary school teacher, with a specialization in science and mathematics. She currently teaches elementary school children at the Al Amal school in Ramle. However, Maha goes above and beyond her role as an educator for her community-she also cares for and facilitates sessions for child victims of domestic violence. 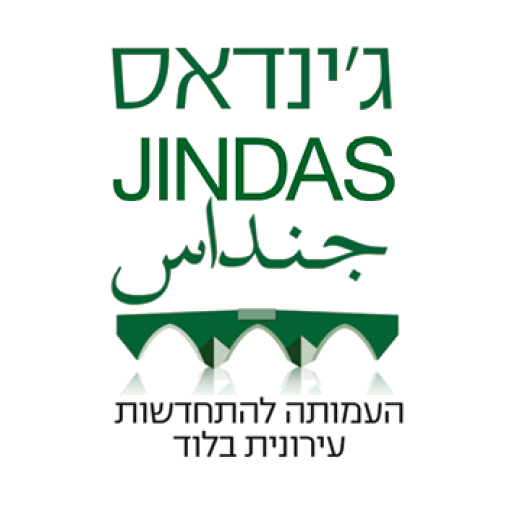 At Jindas, she is the principle coordinator of activities and programs at Bayit Ham, Jindas's after school program for at-risk youth. Maha's dream is to create a warm and loving environment for all the children in her community who lack a safe and caring home. Mor earned a first degree in Social Work from the Ben Gurion University of the Negev and an MBA through the university’s social leadership program of the Guildford Glazer Faculty ofBusiness & Management. She previously worked as a community organizer with the Housing, Community, and Law Clinic at Tel Aviv University and as a coordinator of the legal department at “Koach L’Ovdim.” Mor was a project manager for Breaking New Ground in Community Development, an EU Partnership for Peace initiative, and served as co-founder and chairwoman of “Osim Shinui,” a national student movement working to improve the status of social workers in Israel. Raised in the village of Undelaf, Ethiopia, Ingudai immigrated to Israel with her family at the age of 16 and lived in the town of Qiryat Gat for almost two years before moving to Lod. She spent eight months in a formal ulpan Hebrew instruction program but otherwise learned much of what she knows through lived experience. Ingudai worked at a bakery, as a guide for children with special needs, and volunteered for Menifa, an organization providing services to youth at-risk. She joined Jindas and Mosaic: Lod Multicultural Center in 2016 and believes in working to end racism, such that each person will accept one other without any judgement based on appearance or background. Yigal is a native Hatzor HaGalilit in northern Israel. He received his first degree from Tel Aviv University, is a licensed attorney, and has many years of experience in resource development for a wide variety of leading NGOs in the fields of education, youth with special needs, Holocaust survivors' rights and others. A strong believer in community-based local development, Yigal understands the importance of empowering individuals to make real change in their immediate environments. Betty Soibel was born in Rehovot, Israel to a family of Russian olim and grew up in Los Angeles, California, where she was active in Jewish community work and environmental activism. She recently graduated from the Joint Program between the Jewish Theological Seminary and Columbia University in New York City, where she studied Jewish History and Urban Studies. During her summers in college, she worked as a Rosh Ayda at Eden Village Camp, a pluralistic Jewish summer camp focused on farm-to-table living and social action. Throughout college, she also interned for PresenTense, Hazon, and Food & Water Watch, which gave her the opportunity to explore non-profit work in the legal and public health sector. She is interested in sustainable place making, social change, and relationships between American and Israeli Jewry. Itai is a City Council member and former chairman of Tel Aviv Shafdan (Wastewater Treatment System). Founder and CEO of “Derech Poriah” specializing in projects of urban regeneration and environment, Itai is socially active in various organizations promoting equal rights for minorities in Israel and environment. Elad is the owner and co-founder of NOX Group, Israel’s largest food and beverage company specializing in entertainment, culture and nightlife. In parallel, Elad has dedicated his career to strengthening Israel's socioeconomic resilience, at home and around the world. Elad was tapped by the Foreign Ministry to lead delegations of business and social leaders to Morocco, Taiwan and South Korea. Currently, he is the Executive Director of Zikaron BaSalon, a social venture that offers a new, meaningful and intimate way to commemorate the Holocaust Memorial Day and address its implications through discussions with over 750,000 participants around the world. Previously he was the Executive Director of Momentum, which helped soldiers with training to make the critical transition between army and civilian life, and led innovation initiatives at the Tel Aviv Municipality and the Rothschild Caesarea Partnerships organization. Following his release with Highest Honors from service as a commander in the Special Forces Yahalom Unit, he co-founded Yahalom Foundation, the unit’s official non-profit organization for active soldiers and alumni. Elad is also an eager social entrepreneur and created 'Supper with Survivors project', social events combining thousands of holocaust survivors with hundreds of volunteers taking place in Jewish holidays throughout the year. He provides strategic and business counsel in leadership roles as a member of the boards and/or committees of organizations including: ROI Community, American Jewish Joint Distribution Committee, World Union Jewish Students, Nova Project, Nachshons Project, AlmaLinks, Excel Fellowship, Stand with Us Fellowship and now Jindas. Elad completed his studies in the honors business administration program at the Interdisciplinary Center in Herzliya. Irit holds a BA in Economics and Management from the Technion and a M.A in Geography and Urban Planning from Hebrew University. Irit was a program manager at JDC Israel and development manager at the international fellowship of Christian and Jews. Irit is socially active in a variety of initiatives dealing with Urban Planning, eradication of poverty and the specialization of the third sector in Israel. Michal is the CEO of Wikimedia Israel. She was the manager of the Centers for Young Adults in the JDC Central District and manager and founder of the Weinberg Lay Leadership Center at JDC Israel. She is a former Chairwoman of the Association of Women and Their Bodies, and a social activist in organizations that promote social change with an emphasis on gender equality and promoting dialogue between Jews and Arabs in Israel. Shira holds a Masters in Community Social Work from the Hebrew University. She manages an employment program of the “Beatzmi” association and formerly managed the Lod municipality’s mediation center for five years. Shira is a resident of Lod and a social activist in the field of mediation and promoting dialogue between different communities in Israeli society, as well as eradication of poverty. Dr. Emily Silverman is a faculty member at the Hebrew University Geography Department where she teaches courses in housing policy and urban regeneration, social aspects of planning, and community development. Emily holds a Ph.D. in social policy from the London School of Economics, a master’s degree in public policy from Tel Aviv University, and a bachelor’s degree in sociology from Swarthmore College in the United States. Yair holds a degree in Industrial Engineering from the Shenkar University. He is the founder and partner of CliniClicks Ltd and Tipulog Israel Ltd. Yair worked as a business consultant in a variety of organizations including the Jewish Agency, Mati, the Ministry of Immigrant Absorption, and the Ministry of Industry and Trade. He is a social activist in organizations engaged in immigrant absorption, ensuring equal opportunities for the disadvantaged, and promoting affordable housing in Israel. Dvora is a Consultant in organizing shared processes and is a doctoral student in the Architecture and Town Planning faculty in the Teknion. Dvora holds a master's degree in Social Development Practice from the Barlett Development Planning Unit from the University College in London and a B.A in Politics and Government from Ben-Gurion University of the Negev. She also wrote a thesis on "Opportunities and Obstructions in the Promotion of Democratization of Production". Dvora was also a partner in a research on Housing Issues in London, UK and in Salvador Brazil. In the past Dvora managed the Municipal department at the Shaharit Institute where she trained communities and council members from around the country on community organization of work methods. Dvora has acquired an extensive knowledge in Social Development with emphasis on social aspects of Economical Urban Development. Hana holds an M.A degree in Public Administration from Tel-Aviv University, an M.A in Early Childhood Education and Teleprocessing and B.A degree in Sociology and Labor Studies from Tel-Aviv University. She is a graduate of the Curatorial Studies Program at Tel-Aviv University and is also a senior business coach. Hana has been Holon's Municipality managing director for almost 2 decades. Hertsman initiated broad changes in the municipality- in it's original structure, in the deployment of human resources and generally in the professional and economic management.